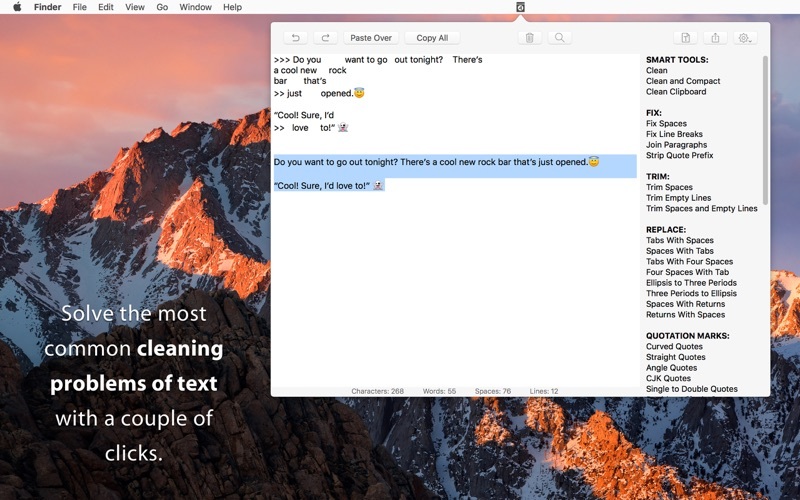 Clean Text is an application for those times when you have to paste some text copied from one document or application into another, and you want the text to get the attributes (such as color, font, dimension and style) of the new document instead of preserving the attributes copied from the old one. 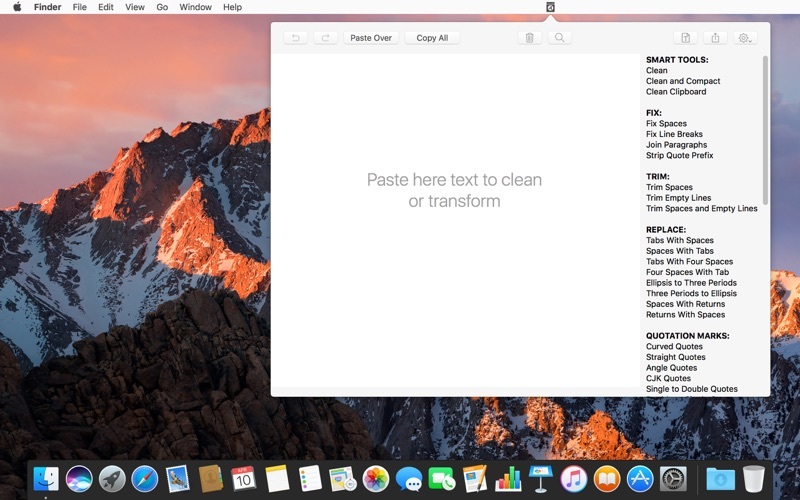 Clean Text for Mac eliminates all text formatting, preparing it for pasting. Moreover, the application performs other useful functions, such as removing empty lines, removing multiple spaces, removing tab characters etc. It’s also very useful for printing out text without wasting ink and paper, as often happens when you print directly from a Web browser. Removes returns within a paragraph and removes multiple empty lines between paragraphs. Replaces multiple spaces with a single space and removes spaces at the beginning and at the end of a line. Replaces each tab with a specified number of spaces. Replaces each sequence of a specified number of spaces with a single tab. Removes the quoting characters “>” at the beginning of lines. Adds the quoting characters “>” at the beginning of lines. Replaces each return with a single space. Replaces quotes with curly quotes. Replaces curly quotes with straight quotes. Text shifting right or left. Adds a specified number of spaces before each line (delimited by line ending). Sorts all the lines all the lines of the text (delimited by a line ending) using ascending order. Capitalizes sentences. Capitalizes the first word of each sentence (delimited by “.” and ellipsis “…”). Removes duplicate lines. Keeps only the first line between a group of equal lines. Text encoding. Windows to Mac encoding. Mac to Windows encoding. Converts MacOSRoman encoding to Windows Latin 1. ROT13. Rotates characters 13 positions in the alphabet. Converts three periods to ellipsis. Replaces each chunk of three periods with one single ellipsis (in Mac version only). 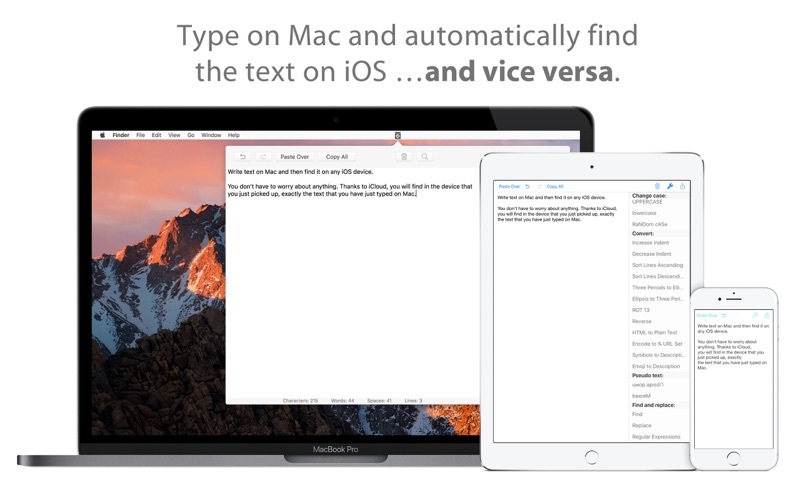 Converts ellipsis to three periods (in Mac version only). Creates fi and fl ligatures. Creates professional publishing fi and fl ligatures for each “fi” and “fl” sequences in the text (in Mac version only). Removes fi and fl ligatures (in Mac version only). 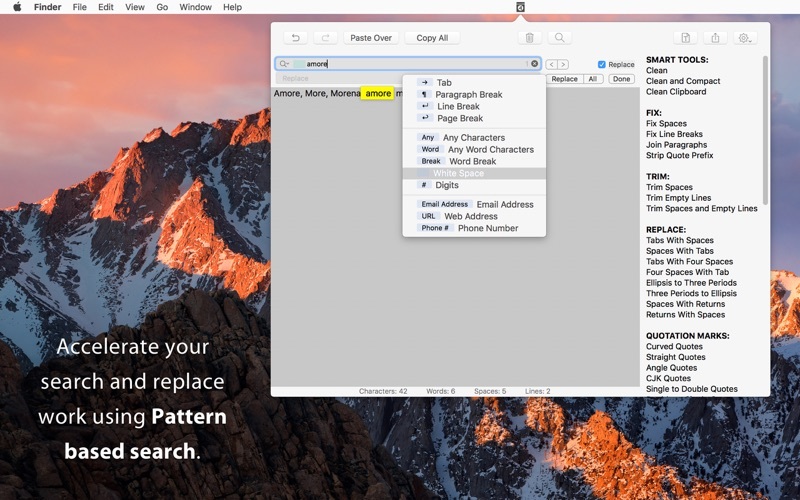 Encodes to Mac Line Endings (CR). Encodes to Unix Line Endings (LF). Encodes to Windows Line Endings (CR+LF). Converts all line breaks to “Carriage Return”+”Line Feed”. New “Copy Highlighted” menu item. 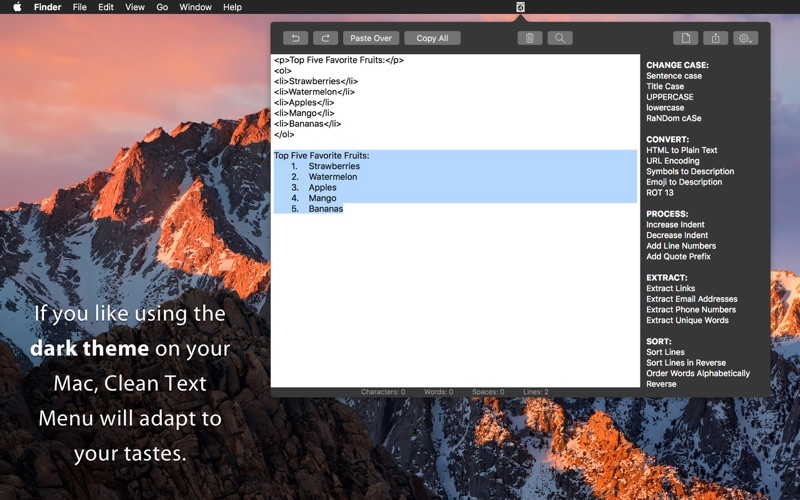 A functionality that allows you to copy to the clipboard all the text highlighted by a search (useful in RegEx searches). Now the “Copy All”, “Paste Over” and “Clear All” features have their corresponding menu items in the menu bar.